EABASSOC Building Sealant is a basic, oil based, external quality caulking compound for joint and crack sealing. It bonds well with most building materials and can be used both externally and internally. bonds well to most materials. EABASSOC Building Sealant, provides a flexible waterproof skin within 24 hours of application, while underneath this skin the remainder of the mastic remains soft and pliant and therefore, able to accommodate movement. This quick skinning property gives protection against rain and allows over-painting very soon after application. The sealant can be painted, although this is not essential. However, it will improve durability and extend its service life. 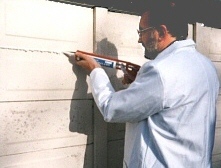 The soft mastic will not crack or sag and so has a longer life potential than cheaper sealants which cure all through. The skin is self healing so if ruptured, it will reseal itself. EABASSOC Building Sealant can be applied to seal glass, metal, brick, concrete and wood. Its main uses are around door and window frames, for glazing windows, for roof skylights and in greenhouses. It is also ideal for weatherproofing lap joints in caravans, containers, boats and vehicles and sealing low movement joints in brick and concrete construction. It is applied through a simple caulking gun.